Status: Uncommon regular spring migrant east and central, rare west. Rare regular breeder southeast, rare casual central. Fairly common regular fall migrant east and central, rare casual west. Documentation: Specimen: UNSM ZM7669, 29 Apr 1917 Lancaster Co.
Taxonomy: Six subspecies are recognized, five in the Caribbean and one, platypterus, in North and South America (Gill and Donsker 2017). Nebraska birds are presumed platypterus. A rare dark morph breeds in Alberta, comprising less than 1% of the overall population (Wheeler 2003); it apparently migrates through Nebraska, as there are 5-6 Nebraska reports: singles in Jefferson Co photographed 25 Apr 2016, at Omaha, Douglas Co 29 Apr 2000, at Indian Cave SP, Richardson Co 5 May 1996, NNF Bessey, Thomas Co 29 Sep 2001, and two with a kettle of 154 over Fremont, Dodge Co 24 Sep 2005. Changes Since 2000: This species is extending its range northwestward in major river valleys, most recently breeding in North Platte, Lincoln Co. This range extension is also reflected by an increase in reports of migrants in the Panhandle, especially in fall. This species is a regular migrant in the eastern half of the state, declining in numbers westward. Rosche (1982) considered it “very rare to rare” in the Panhandle, but in the 2000s reports have increased significantly. There are about 32 Panhandle reports in the period 16 Apr-28 May,13 of these since 2006. High counts: “hundreds” moving north along the Missouri River at Omaha 2 Apr 1978 (Williams 1978), and 14 over Omaha 19 Apr 2017. Summer: Based on a few documented breeding records and numerous breeding season reports suggestive of breeding, it is assumed this species is a regular breeder at least in the lower Missouri River Valley of Nebraska even though nesting is not known to occur regularly at any one site. Ducey (1988) cited only five records, from Douglas, Sarpy, and Nemaha Cos, the most recent in Nemaha Co in 1951 (Fox 1952) and Sarpy Co in 1979 (Williams 1979). 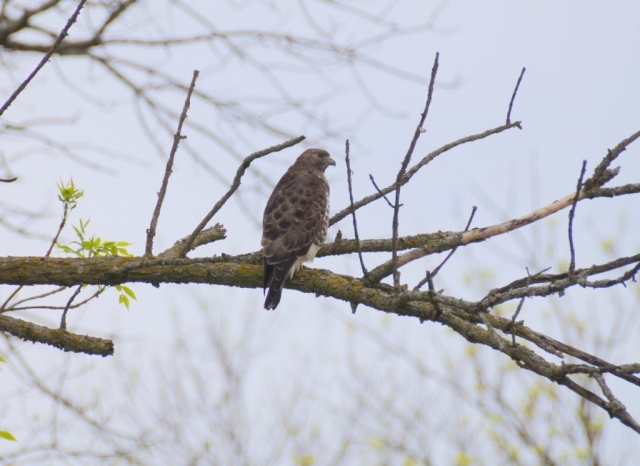 In 1995, adults and 2-3 fledglings were heard 5 Jul at Fontenelle Forest, Sarpy Co.
More recently, as this species has expanded its range to the north and west (Goodrich et al 2014), reports of breeding are increasing. In 2014, a pair was nesting at the Henry Doorly Zoo in Omaha where a female was incubating 13 May; another pair was nesting in Mandan Park, Omaha 21 May, and one was collecting sticks in Bellevue 6 May although a nest was not seen. In 2015, an adult and two juveniles were at Fontenelle Forest 10 Jul and one was at Neale Woods, Douglas Co 20-27 Jun. Six reports of immatures in Washington, Douglas, and Sarpy Cos 31 Jul-17 Aug since 2005 may have been locally hatched juveniles (see Fall). In 2016, there were reports from five locations in the southeast 14 Jun-25 Jul, in 2017 five reports from three locations 19 Jun- 27 Jul, and in 2018 six reports from four locations 2 Jun- 6 Jul. In concert with the range expansion by this species was the exciting discovery of a nesting pair at North Platte, Lincoln Co in 2008; three adults and at least one young eyases were present and photographed 3 Jul, but the nest was damaged by a storm by 17 Jul and the eyases could not be located. Two birds had returned to the site by 20 Apr in 2009; a nest was built but the outcome was unknown. Since 2009, adults have been in the area, with mixed success. In 2012 a pair was photographed tending a nest on 18 Jun, but on 15 Jul the two young fell out of the nest, one dying and other taken to a rehabilitator. An apparently different pair in North Platte had fledged two young by 24 Jul 2014. In 2014 a juvenile accompanied by an adult was near Wright’s Gap, Scotts Bluff Co 16 Aug; pairs have been seen in this area in previous years, but without evidence of breeding. The only other breeding season reports away from the Missouri River Valley and Lincoln Co are Jun 1970 Custer Co, 13 Jun 2014 Sioux Co, and 20 Jun 1998 and 19 Jun 2017 Lancaster Co. There is a specimen, an immature male, UNSM ZM16658, collected 22 Aug 1992 in Lancaster Co. There are earlier reports where summering birds were not noted: 3 Aug 2003 Saunders Co, 7 Aug 1988 Lancaster Co, and 9 Aug 1988 Polk Co.
Hitchcock Nature Center, Pottawattamie Co, Iowa, Hawk Watch data show an average of 748 Broad-wings passing through each year mid-Aug through mid-Oct, with a well-defined peak in late Sep (Hawkcount.org 2017). Similar peak timing was observed on the Nebraska side of the Missouri River in 1994 and 1995, when 107 were counted 23 Sep 1994 and 178 on 20 Sep 1995 (Loren and Babs Padelford, pers. comm.). Westerly reports, including those in the Panhandle, have increased markedly in recent years; of 20 Panhandle reports, 14 are since 2000. The 20 total reports are in the period 13 Sep-5 Oct. There are an additional 13 reports from the central, 10 of these since 2000. High counts: 12,000 over Dodge Co 28 Sep 2018, 178 in Sarpy Co 20 Sep 1995, 154 over Fremont, Dodge Co 24 Sep 2005, and 107 in Sarpy Co 23 Sep 1994. 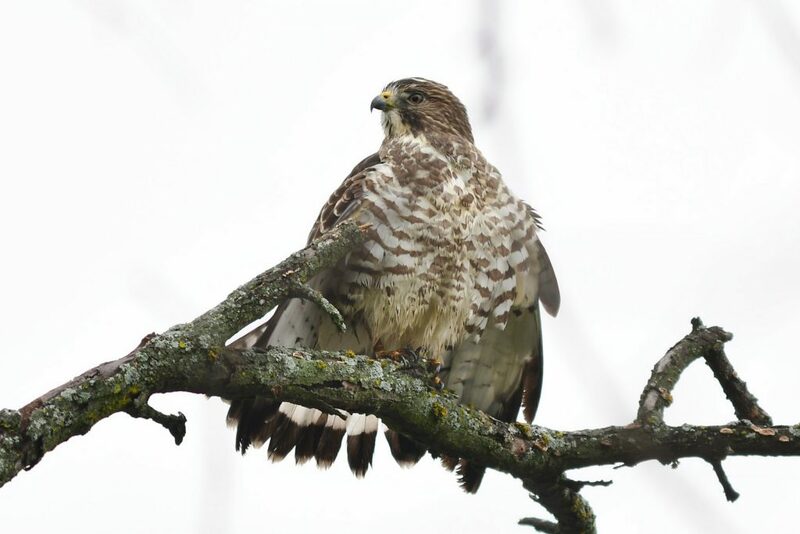 Photograph (top) of a Broad-winged Hawk at Holmes Lake, Lancaster Co 5 Oct 2018 by Steve Kruse. Fox, A. 1952. Missouri River bird notes. NBR 20: 21-22. Goodrich, L.J., S.T. Crocoll, and S.E. Senner. 2014. 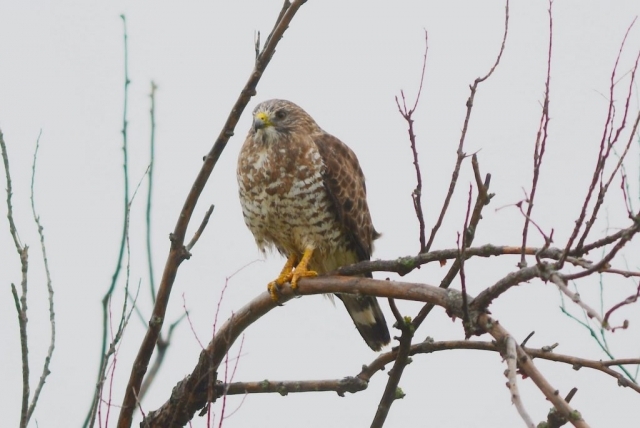 Broad-winged Hawk (Buteo platypterus), version 2.0. In The Birds of North America (A. F. Poole, Editor). Cornell Lab of Ornithology, Ithaca, NY, USA. https://doi.org/10.2173/bna.218Hawkcount.org. 2017. 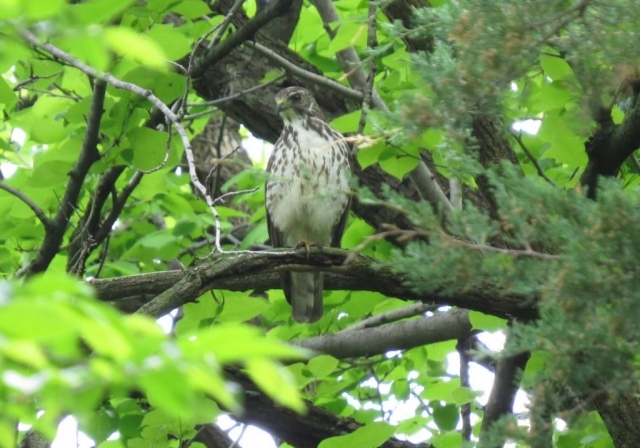 Hawkwatch Site Profile: Hitchcock Nature Center, accessed 22 May 2018.